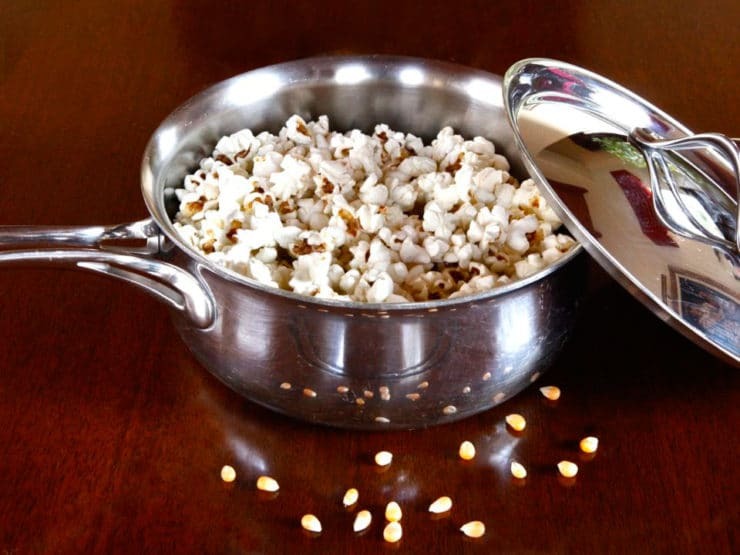 How To Make Popcorn the Old Fashioned Way – Learn how to make popcorn the old fashioned natural way, no popper required, in a pot on the stovetop! 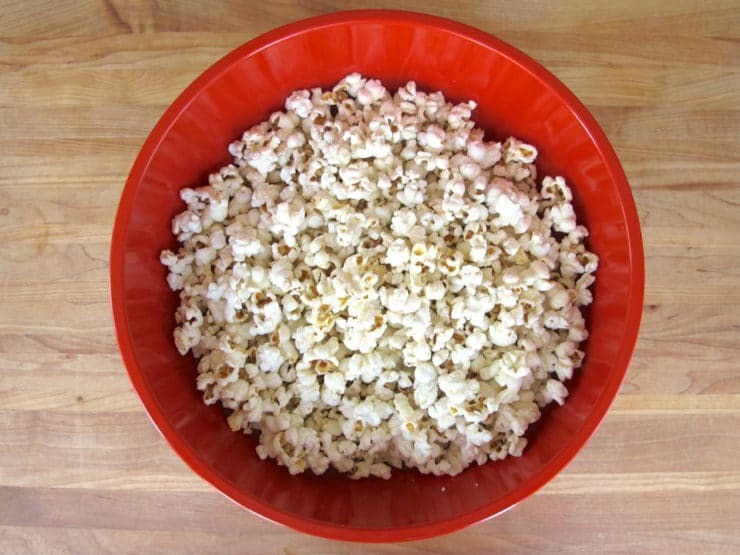 It’s simple & healthier than microwave popcorn. While most of us have grown used to the convenience of microwave bagged popcorn, a couple of years ago I stopped buying it when I learned that most microwave popcorn bags are lined with perfluorooctanoic acid (PFOA). That’s the toxic chemical and carcinogen that can be found in many nonstick skillets and pans– it’s approved food safe by the government, but the fumes from cooking on a PFOA skillet can kill a parrot standing nearby. This, in addition to the fact that most microwave popcorn brands contain partially hydrogenated oils, artificial colors and flavorings, and preservatives… well, let’s just say it’s not something I want to feed my family. Luckily, it’s super easy to make popcorn the old fashioned way, on the stovetop! All you need is a pot with a lid, a vegetable-based oil with a high smoke point, and… you guessed it… popcorn kernels. According to John Russell Bartlett’s 1848 Dictionary of Americanisms, popcorn’s name was derived from “the noise it makes on bursting open.” When it comes to snack cravings, there is no sound more inviting than popcorn popping, especially on movie night.Can you imagine movies without popcorn? Surprisingly, theater owners were not on board with popcorn sales in the beginning. They thought it might create an unnecessary nuisance in addition to requiring expensive changes, like installing vents to rid the building of smoky popcorn odors. Hawkers, seeing the potential in popcorn sales, took matters into their own hands and began selling popcorn and Cracker Jack while walking up and down movie theater aisles. The Depression brought a shift in perspective for theater owners, who began to view popcorn as a small luxury that patrons could afford. Unlike most treats, popcorn sales actually rose during the Depression. Instead of installing indoor concession areas, theaters charged outside venders a dollar a day to sell popcorn from outdoor stands. In 1938 Glen W. Dickson, the owner of several theaters throughout the Midwest, began installing popcorn machines in the lobbies of his theaters. The construction changes were costly, but he recovered his investment quickly and his profits skyrocketed. In my opinion, the best way to recreate the allure of movie theater popcorn is to pop it yourself, the old fashioned way, on the stovetop. This method lends itself to endless topping options. Trying to stay healthy? Pop it in grapeseed oil with a just a sprinkle of coarse sea salt. Feeling indulgent? Go for melted butter, cinnamon sugar and a drizzle of melted chocolate. Below I’ve listed suggested some topping ideas, but by all means be as creative as you like! What’s your favorite way to eat popcorn? 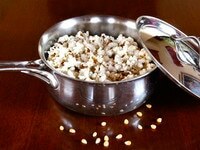 Learn how to make popcorn the old fashioned natural way, no popper required, in a pot on the stovetop! It's simple & healthier than microwave popcorn. Serving Size, Nutrition: 1/4 cup of kernels equals roughly 8 cups of popped popcorn. Nutrition calculated using the butter topping option, 2 cups of popcorn per serving. Heat oil in a large pot over medium heat. You’ll want to use enough oil to just cover the bottom of the pan, so adjust the amount according to the size of your pot. At this point, if you want to spice up your popcorn, you can also add some spices to the oil-- that way they will evenly coat the kernels as they pop! Other toppings should be reserved for later, including melted butter which can burn due to its low smoke point. You can test your oil by tossing in a few kernels and covering the pot. Once they pop, you’ll know your oil is hot enough to add in the rest. Add the rest of the popcorn in an even layer across the bottom of your pot. 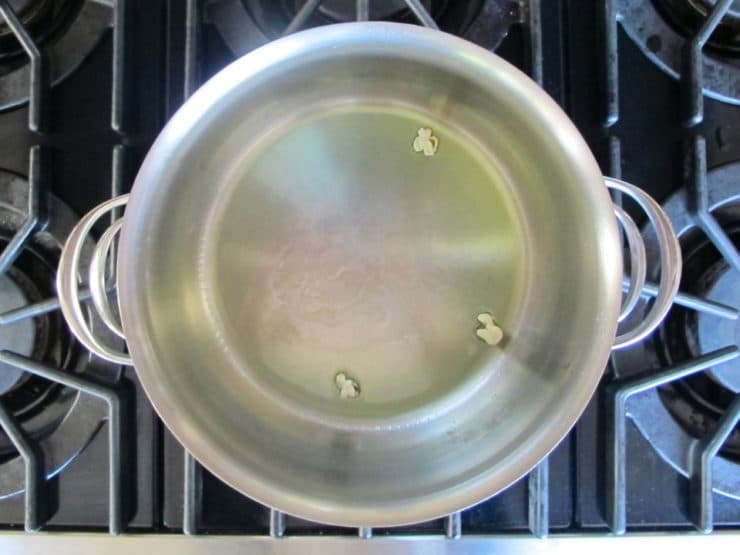 Remove the pot from the heat for 20 seconds to allow all of the kernels to come to the same temperature. Once 20 seconds have passed, return the pot to the heat and cover. Once the kernels are really popping, carefully move the pot back and forth across the burner to keep the kernels inside moving, so they don't burn. 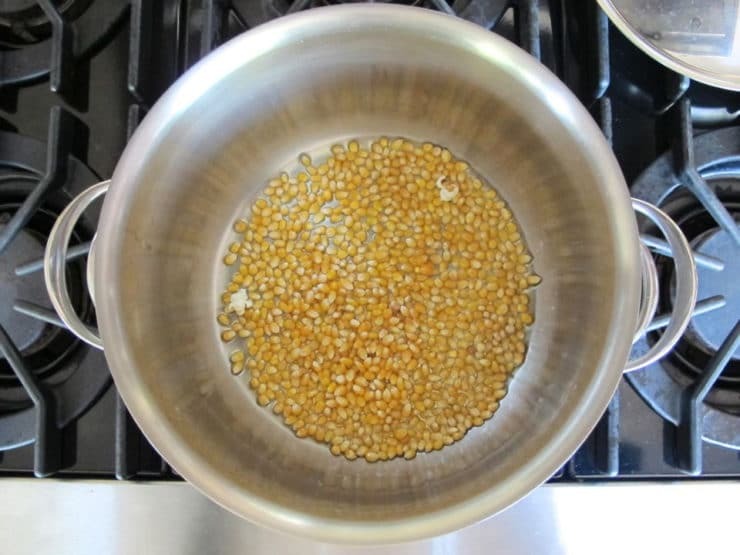 When the popping slows down and there are long pauses between pops, remove the popcorn from the heat and immediately transfer to a large bowl. If you leave it in the pot, it will burn. Toss with topping of your choice and serve while still hot. Great details for the novice. I will admit I have popcorn for dinner on occasions so happy national popcorn day! What brand popcorn has the soft hull ? Also I love buttery popcorn but have had problems with the popcorn shriveling up after I put the butter on it, any suggestions? Butter shrivels and melts popcorn because of all the watery-ness in it. Movie theatre butter doesn’t because it’s mostly made of oils and natural butter flavoring that more sits on top of popcorn, rather than soaking in and destroying it. You can purchase liquid popcorn butter at most any grocery store, or search for a dehydrated butter powder to sprinkle on top. Spray your popcorn down with a thin coating of non stick cooking spray, toss, and sprinkle with dehydrated butter powder. It won’t be the same as movie flavor, more a natural butter flavoring. These are just some options and I hope they help! Thank you for sharing your technique. The pre-packaged processed microwave popcorn always made me feel slightly ill after I ate them so I then switched to just cooking the plain kernels in a microwave (I used an old large plastic salad bowl with a ceramic plate on top) which was an improvement but still far from perfect and about 25% of the kernels would not pop. I finally quit using my microwave oven all together after reading enough convincing evidence about them not being good for the health of humans (one reason was that Russia banned them in 1976 which I read about at the Dr. Mercola site which lists many other reasons not to nuke food). 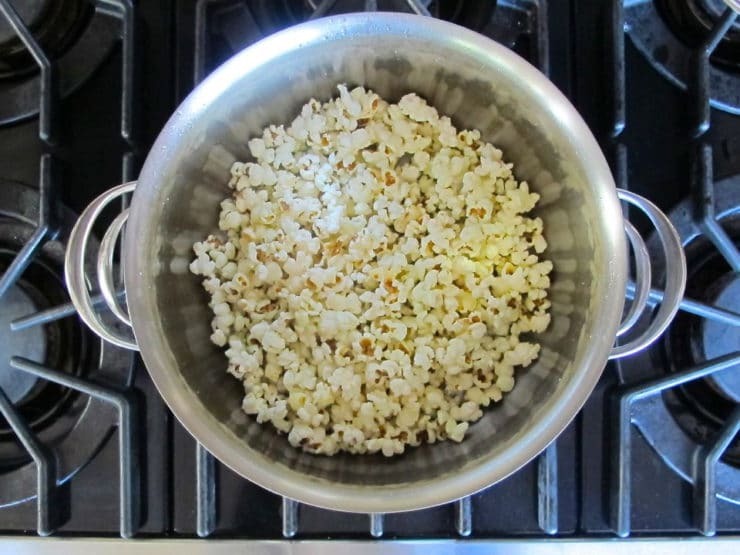 I recently started doing it the old-fashioned stove-top way like you are doing and the popcorn is delicious with all the kernels popped if done right. I use coconut oil (the price on DrVita 54 oz is very reasonable at Ebay) to cook it in. I was using grapeseed oil very heavily awhile back but found out that the processing method was possibly toxic to the human body so I quit using it. For seasoning I love the combination of Celtic Grey sea salt, nutritional-yeast, Dulse flakes & cayenne powder. So happy to read this item and all the comments associated with it. Does anyone know how to make popcorn over a fire? I have a popcorn popper (black rectangular metal box with sliding lid, extra long handle) but am not sure how to do it over the coals. Thanks and your blog is wonderful! Hi Debs! The basic concept is the same whether over a stovetop or hot coals– only with your long-handled popcorn popper, you want to hover it very close to the hot coals (not touching) and keep the box moving as it heats up, swirling the seeds inside so they don’t stay in one place for too long and burn. Hopefully the handle is not metal, which conducts heat– if it is, be sure to use an oven mitt so you don’t burn yourself! so we can make our own! Does the grocery store sell organic corn kernels???? Some grocery stores do, yes Elizabeth. I believe Trader Joe’s carries them and so does Whole Foods. I am going on 93 and many years ago we wised to beta sachet of savoury powder enclosed with the popcorn. It was certainly very nice but I have no idea what it was. Have you any idea what it could have been? Hi Paula! Hmm, I’m not sure what that savory powder would have been. Can you describe the flavor? What hapend to the open fire whay? Once in a while we stir in a bit of peanut butter. Messy, but so tasty! Tori, do you have recipe for Crackerjacks? Yum! No I don’t Sheila, but that would be a fun one to try! I bought one of the, now considered” Old Fashioned” pop corn popper with the crank you could twist. I just go with the plain pop corn, but I may try some of the spiced in the next batch. I would not trade my popper for anything. Kids already want it when I stop making pop corn. Some one will have to pry it out of my cold, dead hands to get it! ! I hadn’t had popcorn in a long time and then bought a caramel-chocolate popcorn concoction that was very good but very spendy. Long story short, I decided to make my own version …harked back to my childhood (I’m 58) and after making it again on the stovetop could NOT figure out why I ever made it any other way. I make a heaping 1/8 cup (kernels) nearly every afternoon as my salty snack. A bit of salt and cheese powder does it for me. And the caramel-chocolate version is a nice sweet treat which does fine in the frig and ironically tastes ok cold – at least to me. I have a mad addiction to popcorn and always cook it on the stove top. I’ll have to share this info. Tori, Interesting that popcorn is not genetically modified. Thanks for that information. I am surprised since as you stated, most corn in the U.S. is GMO. If I start popping my own, I would want to find a variety that has a soft hull, because some popcorn varieties taste like nails, others are nice and soft with almost no hull. I’ve used some from Whole Foods that was organic but hard enough to crack a tooth on. Thanks, I didn’t read those comments, I will read them and look into it. I pop it in Coconut oil, then pour some melted coconut oil over it with sea salt! This way is great for making popcorn balls. But I love chemical popcorn its what makes it good. I always go organic when it comes to corn & soy because non-organic corn and soy are almost always genetically modified and heavily treated with pesticides. There is organic popping corn available, but I haven’t found any that I like, every one I have tried has a tough husk. Yuk. I’ve been buying bags of organic popped corn either from Whole Foods or a local supermarket here that has their own organic brand. Rich, if you read through the comments above you’ll see that no popcorn variety in existence has been genetically modified (thus far). Pesticides are a different story, but GMO is not a concern when it comes to popcorn… at least, not so far. Yes, I always pop my own. Microwave. Regular kernels. Brown lunch bag. For our microwave popcorn setting about 3 tablespoons of kernels is right. It is done when the popping is less than 3 seconds apart. No chemicals. And then we add a touch of real butter and a tiny bit of fancy black salt. Heavy bottom pan. Don’t need that much evoo. It’s great. I pop mine in a brown paper bag in the microwave or for larger amounts a glass bowl in the microwave. One of my alltime favorite snacks. Make it with real butter and seasalt – so tasty. As my daughter almost burnt the house down making stove-top popcorn, I’d say it too could be bad for your health…. Stir in some cinnamon and a pinch of salt to the melted butter, then sprinkle with sugar. My husband loves it! I hate the artificial taste and smell of microwave popcorn. It makes me nauseated to smell it. I use a hot air corn popper (made by Presto), and it couldn’t be easier. My husband and I love popcorn. Our favorite way is pop it in oil and put butter, garlic, salt, and parm cheese. We have had it for dinner many times in our 30+ years of marriage. I stopped buying/eating microwave corn years ago for all the reasons you listed, PLUS! Stovetop just tastes a million times better. I use plain old canola oil, and I toss one kernel in the pot with the oil. When it pops, I know it’s time to toss in the rest. Takes out all the guesswork with knowing when the oil is hot enough. I always pop our own..kids love it.. House smells amazing. It tastes so much better and the house smells like real popcorn not burned chemicals! My uncle would pop it in peanut oil and dump in brownbags! The oil gave it a good flavor! Yes! micro wave popcorn is not good for you! I have stopped eating processed popcorn, among other foods. I make it with the Whirla Pop! Three minutes for the best tasting popcorn., 2 tsp oil, 1/4t sp salt, 1/2 cup popcorn kernels and whirlaway. That’s the only way I do it, my microwave’s wattage is kind of low. I use an air popper, and add butter, onion powder, and parmesan cheese. I prefer the white over the yellow kernels. I do the lunchbag in the microwave, as well. It works great! stove top homemade, we do it every weekend. Great stuff. Love popping popcorn on the stove. Pour on a little butter, add salt and parmeson cheese. So so good. Only popcorn we make is the old fashioned kind…love it. I’ve been doing this for years; it’s so much cheaper, too! Sometimes I add some sugar to the oil… gives the popcorn a nice lightly sweet coating. So good! I use my induction plate with a pan to make mine…. Works really great…..
Our air popper lasted for years!!!!!!!! Actually think our daughter ran off with it. So do I because it is so fast! Me too, I’m on my second one. It is also critical to use organic corn kernels, since all others are GMO corn. Kirsten Roth Hall actually there is no genetically modified popcorn currently available on the market. The variety of corn used to make popcorn has never been genetically modified. I learned that when researching a piece for PBS Food, found it quite an interesting fact considering so much corn in the U.S. is GMO! Well,thanks for this info!That is new to me. I threw my “normal” popcorn out and replaced it with organic. This will definitely put me on the safe side, less pesticides, too, no matter what. Wow! That IS good news! I like the convenience of microwave popcorn occasionally, but I prefer the old fashioned stove method flavor the best! I use Paul Newman’s and it is the real thing! But you are so right! !